This program will prepare you to create engaging content and deliver it through any medium. Earn a full spectrum of skills — ranging from television production and digital filmmaking to web streaming and interactive content creation. No BYOD costs. We provide digital camera, audio, lighting and grip equipment. No fully loaded MacBook Pro requirements either. Loyalist College offers the use of Mac and PC labs with relevant software to help you complete your work. May enjoy recording the world through a camera, phone, iPad, etc. Keeps current with new technology. Likes working in a fast-paced environment. Provide well-rounded skills by performing all production and crew functions in studio, field and post-production environments. Specialize with crew rotations in your area of interest and choose specific roles in digital filmmaking, remote event production and content creation for clients. Produce creative, interactive content on multiple platforms, broadcasting across Canada and to the world. Participate in studio tours and seminars such as the TIFF Bell Lightbox Series. Scripts written in the first year and developed in the second come to life on the big screen in the final year with a public screening. 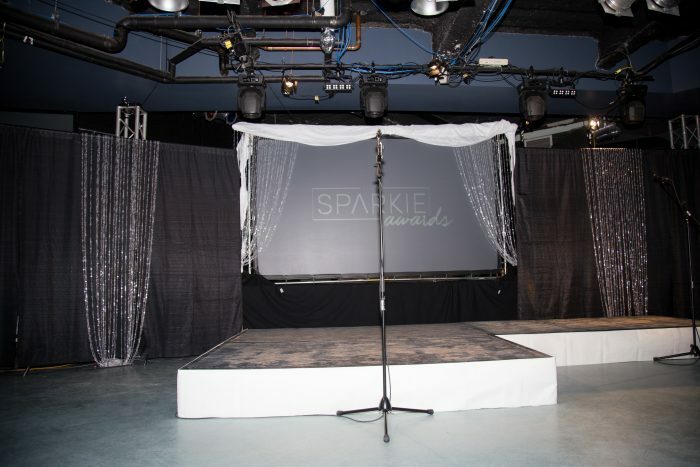 The annual live awards show ‘The Sparkies’ celebrates academic achievements with awards presented to students in all three years of the program. The recipient of the Dome Award, chosen from first-year students, receives $2,000 towards tuition. Research and apply for a four-week field placement in your second year, gaining valuable experience and industry contacts. Finish your studies with a four-week placement. Students have done placements with CBC, Bell TV, Rogers Sportsnet, TSN, Citytv, Canwest Global, CTV, Corus Entertainment, Blue Ant Media, Hughes Integration, Shaw Media, Evertz Microsystems, Ross Video, many radio stations, and media companies around the world. Learn from a diverse, skilled and accessible faculty team with experience at Canada’s major broadcasters, production companies and international sporting events including the Olympic Games, the World Cup, NASCAR and the X Games. Professors’ wide-ranging roles in the industry include: reporter; director; producer; camera person; graphics and motion graphics designer; director of photography; radio anchor; TV producer; documentary producer; production executive; broadcaster; writer; videographer; features producer; ENG editor; floor director; studio camera operator; and lighting director/designer. Consultation with an advisory committee of national industry leaders ensures the program stays up-to-date with changes in this ever-evolving industry. Today’s film and TV industry works on certain expectations and specific models of behaviour. Detailed working documents and specific procedures in TV are introduced. This course will explore these industry methods to set students up for success in their next two years and beyond. This course introduces students to the world of computer-generated images, beginning with character generation and ending with complex graphics sequences. 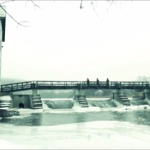 Student-generated images are incorporated into internal College broadcasts. This course introduces students to the foundation of the visual component of content creation – how a camera works and its functions, how to plan and shoot a simple sequence/scene including producing a location diagram, and the introduction of lights and doing a basic lighting set up. This course focuses on basic content editing methods and operations using state-of-the-art software and facilities. Students carefully pre-plan their projects prior to editing. Students gain an understanding of how the roles of the editor and content editing have evolved, and continue to evolve. This course is an introduction to the elements of studio production. The focus is on the basic operating techniques of television studio equipment. Objectives are met through demonstration and hands-on exercises. This course is an introduction to contemporary video technology. 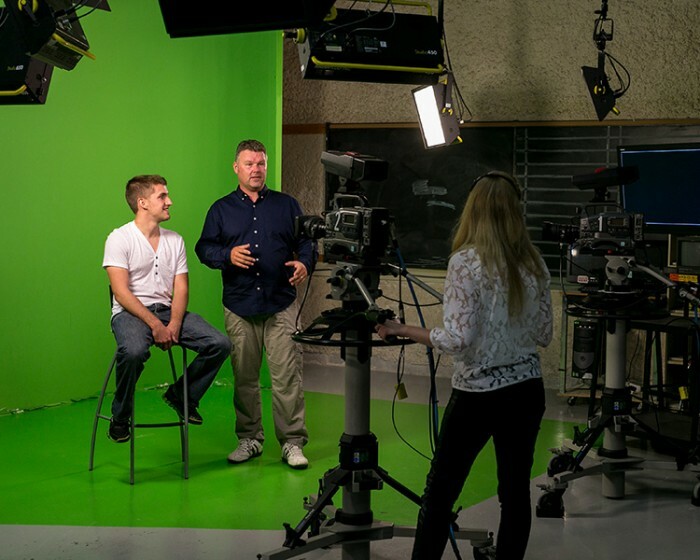 Students learn the basic operational and electronic characteristics of the video equipment used in the first-year production studio. Students also become familiar with basic test and measurement procedures used in digital television operations. This course provides the student with the essential background knowledge to develop the necessary skills needed to work with advanced sound acquisition techniques and to learn the basics of audio post production using ProTools. Students learn the basic principles of acoustics, equalization, editing and mixing. This course is a concentration in computer-based painting, layering and an introduction to animation. The Mac computer platform and operating system are introduced to students. Attention is given to specific creative computer techniques allowing students to generate graphics that are integrated into daily productions. This course builds on what was learned in Field Production 1 and introduces 3-point lighting of a subject. Planning, shooting and editing skills, in conjunction with Post Production 2, are refined through the production of short video segments culminating in the creation of a short documentary. Students expand on their editing toolkit started in Post Production 1 and continue to create compelling content in the edit suite. Pre-edit planning becomes more complex to enable students to craft the best possible story with the footage they gather in Field Production 2. More advanced concepts are explored and new platforms are introduced that will take them to the next level in post-production. Students study more sophisticated program formats and operational techniques. Students continue to develop individual production skills during the production of a live-to-air broadcast. Emphasis is on creating a production team and developing a presentation towards industry standards. This course builds on the technological foundation laid out in Technical Operations 1. 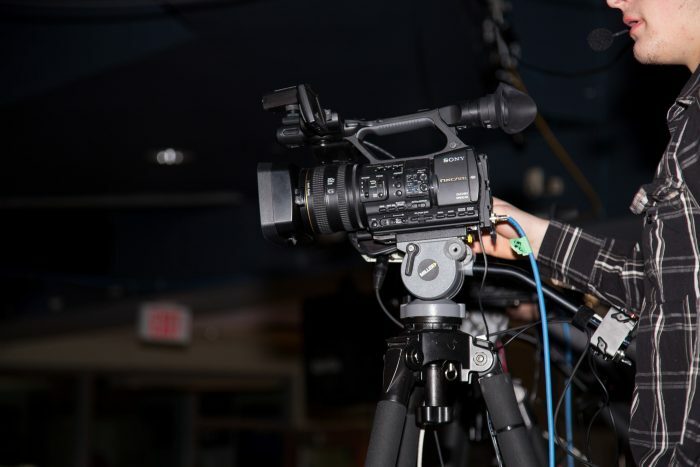 Students learn and are evaluated on the intermediate operational and electronic characteristics of the video equipment used in the production studio as well as field equipment. Students also become familiar with intermediate test and measurement procedures used in digital video operations. Learn industry standard formats to write short- and long-form writing. Short-form script writing explores the art of creating host links for magazine shows, series production, etc. Long-form script writing allows students to explore their creative storytelling, working towards creating a script for a short film that may eventually be produced in their third year. Create short documentaries, tell real-life stories, on screen, in your community. This course combines storytelling and field production techniques to create short-form documentaries about issues, people and places in the local area. Students work in teams of four to research, pitch, write, film and edit their documentaries, with guidance from faculty at each step in the process. The emphasis of this course is to create and maintain graphic sequences for daily broadcasts. Students create billboards, character generation, animations, sports and weather graphics for use in locally/nationally broadcast news, lifestyle, sports and magazine programs. The Mac platform continues to be used to introduce basic web design/animation and intermediate computer concepts. One of the staples of today's television industry is reality based programming: cooking, decorating, woodworking, etc. In second year, students produce “Chef School” a reality style cooking show featuring students and faculty from the Loyalist Culinary program. The show airs on our YouTube channel LoyalistCollegeFTVP and the website loyalisttv.com. The focus of this course is to continue the exploration of post-production workflows and techniques. Students learn new editing software and techniques, and will design and ready material for a number of delivery platforms, including Blu-ray discs and web-based second-screen content. An introduction to the fast-paced world of television news. Students learn the pre-production process as well as the associated jobs that go into making a basic newscast from writing script to the creation of graphics. 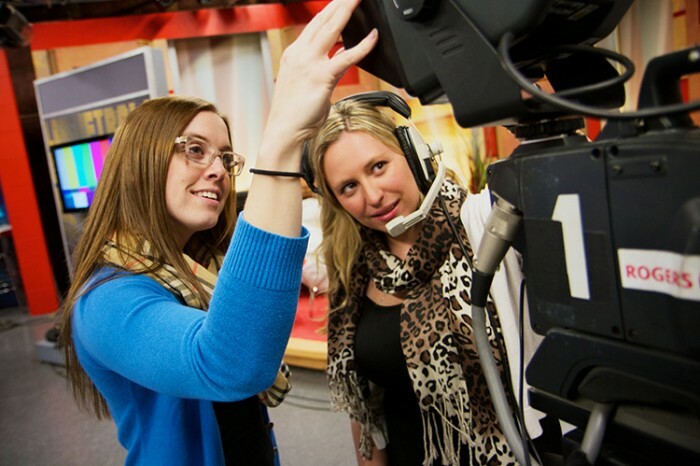 This course provides the foundation for News 2 in which students will produce a weekly newscast. This year-long course will explore the production and technical aspects of multi-camera television productions outside the television studio. Students cover the pre-production, safety and production requirements used in remote productions of all sizes and genres. 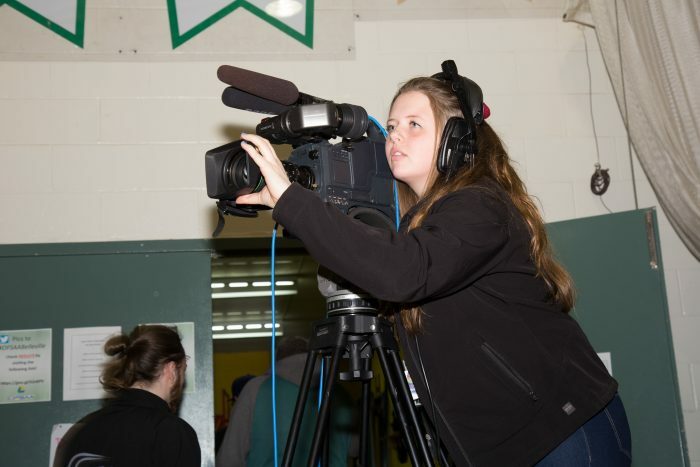 This course will also be used to showcase student skills in remote productions as they cover events both in the College and in the Quinte area. Students are also introduced to working with outside facilities using the Cogeco TV mobile truck. 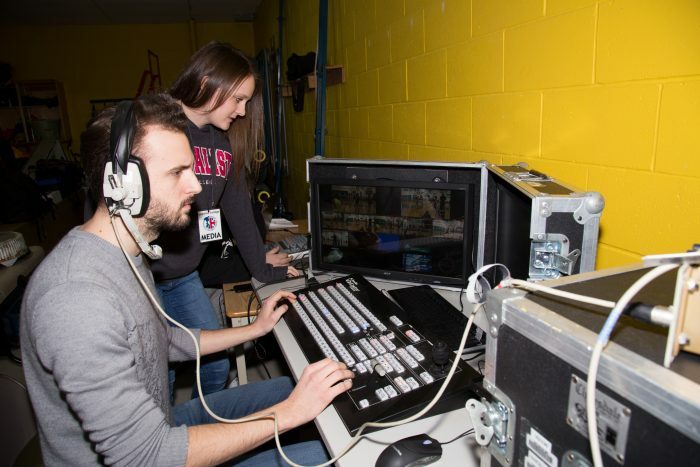 Eligible Film and TV Production diploma graduates have the opportunity to enter York University's Consecutive Bachelor of Education (BEd) in Technological Education program. Students need to budget for placements in the fourth semester (four weeks) and the sixth semester (four weeks). Additional costs, such as travel and parking, may be incurred during placements. Students must be prepared for an above-average commitment of time and intensity. A valid driver’s licence is of great use in the program and essential in the industry. A College vehicle is available for use on assignment by students with a G-level driver’s licence and Driver Abstract (insurance provided). A news segment produced by TVNM students. 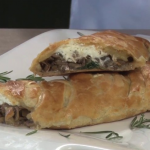 A regular cooking show produced by TVNM students featuring Loyalist Culinary Management Professor and Chef John Schneeberger. This is Episode 6: Accordion Cutter.